Jodhpur, the second-largest city of Rajasthan, was founded in 1459 by Rao Jodhaji, chief of Rathores ruling over Marwar. While visiting the city, you will find almost every building painted in same light blue hue. 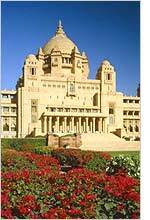 This 'Blue City' has numerous magnificent edifices including Mehrangarh (Majestic) Fort and Umaid Bhawan Palace. There are enough world class accommodation options available for the tourists visiting the city of forts, palaces and other remnants of medieval era. A wide range of heritage, luxury, deluxe and economy hotels and guest houses cater to the needs of the visitors properly.